DEWALT will replace this Industrial Rack due to faulty materials or workmanship for one year from the date of purchase (please be sure to keep your receipt). This warranty does not cover part failure due to normal wear or rack abuse. This warranty does not apply to accessories or damage caused where repairs have been made or attempted. For further detail of warranty coverage, call 1-844-377-8451. The NewAge Products VersaRac and 20 piece Multi-Hook Kit is an innovative solution for freeing up floor space in your garage or workshop. Durable and safe, the perimeter support beams are built with extra strong 13 gauge steel, with a rust and scratch resistant powder-coated finish, available in Hammertone Gray or High-Gloss White. The heavy duty VersaRac can support up to 600 lbs. of weight, and gives you up to 104 cu. ft. of overhead storage space to hold large and bulky items. The VersaRac is easy to install into wood joists and is adjustable in width from 6 ft. to 8 ft. allowing you to maximize your space while providing clearance for your doorway. It can be installed at a minimum height of 18 in. or can be adjusted from 27 in. to 42 in. in height. Store your winter tires, camping gear, or luggage within easy reach, while regaining space to park your car. The NewAge Products Adjustable Versarac Ceiling Storage Rack with 12 piece multi-hook kit is a simple solution to freeing up floor space in your garage or workshop. Durable, sturdy and strong with 13-Gauge perimeter support beams reinforcing 4 mm diameter wire grids, this rack provides 104 cu. ft. of storage space with a 600 lb. storage capacity. Easy to install, the height-adjustable rack can be installed as low as 18-inch with additional adjustment notches at 27-inch to 42-inch and has two width adjustments, taking it from 6 ft. to 8 ft. Ideal for storing coolers, luggage, file boxes, sporting equipment or practically any item, this rack has a powder-coated finish that protects against scratches and rust for lasting beauty and is available in grey or white. 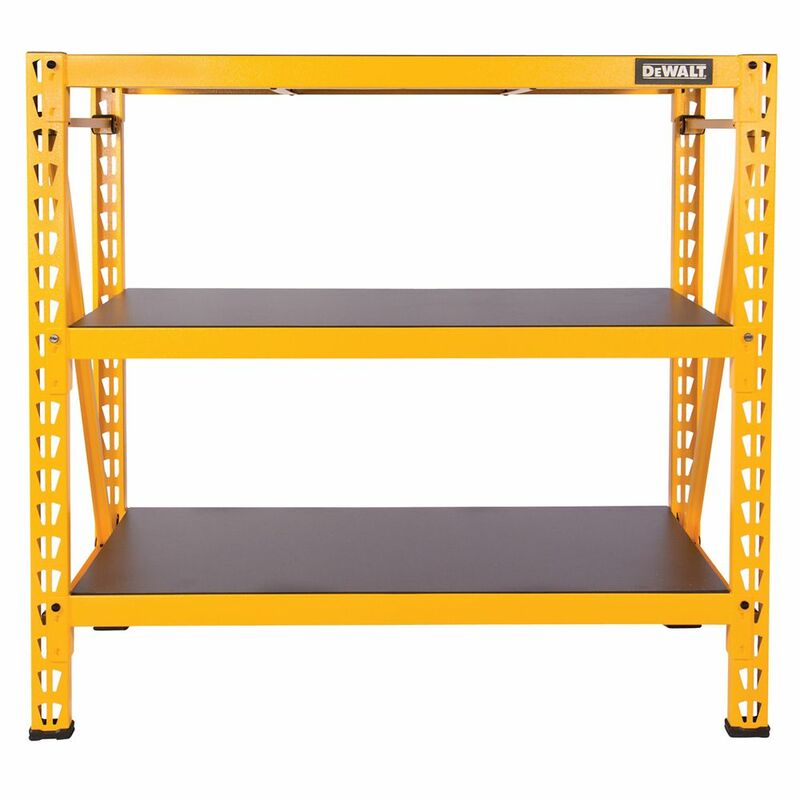 48-inch H x 50-inch W x 18-inch D 3-Shelf Steel / Laminate Industrial Storage Rack Unit in Yellow The DEWALT DXST4500 4 Foot Tall, 3 Shelf Industrial Rack was designed and engineered to provide heavy-duty storage for both professional and home use. The three black laminate wood composite decks can each support an evenly distributed 1,500 lb. for a total of 4,500 lb. The uprights, crossbeams, and support straps are all made from powder-coated steel and are designed so that each shelf has 5 support straps to prevent them from twisting or buckling under pressure. The shelves are adjustable in 2.35-inch increments and the locking pins ensure that each shelf is properly installed. For added security, the rack has glass-filled nylon feet to protect flooring and a wall mount bracket to prevent accidental tipping. Each rack also includes 2 stacking plates to join two racks together vertically or connect them horizontally using the shelves alone. For easy assembly two uprights come with pre-installed horizontal and diagonal support beams making getting started fast and stress-free. 48-inch H x 50-inch W x 18-inch D 3-Shelf Steel / Laminate Industrial Storage Rack Unit in Yellow is rated 4.8 out of 5 by 172. Rated 5 out of 5 by Bob from Not hard to assemble at all. Lay the parts out... Not hard to assemble at all. Lay the parts out and take your time. You don’t need two people.This is a very nice looking rack and very solid. I’m surprised it’s an online only item. Rated 5 out of 5 by Lenny from OUTSTANDING! I AM A HUGE DEWALT FAN AND PURCHASE 90% OF MY DEWALT TOOLS AT HOME DEPOT. OUTSTANDING! I AM A HUGE DEWALT FAN AND PURCHASE 90% OF MY DEWALT TOOLS AT HOME DEPOT. Rated 5 out of 5 by Tagg from Easy to assemble, bright in the space and super functional. Would definitely buy again. Easy to assemble, bright in the space and super functional. Would definitely buy again.